The Harriers classy defender, Jeff Kenna, has today left the club to pursue a new career in management with the Eircom Premier League club Galway Utd. The move has been rumoured for weeks and it was well known that Jeff was keen to get into management once his time playing was over and to that end he has been taking his coaching badges. He joined the Harriers two years ago just prior to the start of the 06-07 season and at the time his signing was seen as something of a coup with the Harriers signing someone of his pedigree. After starting his career at Southampton with Alan Shearer he then moved for a fee of £1,500,000 then, via a few loan moves, to Birmingham City for three years and then to Derby before finally settling at the club of his dreams, Kidderminster Harriers. 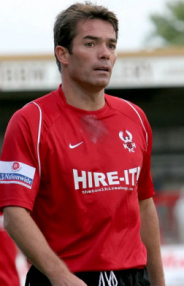 Jeff has mostly been ever present for us and has played in a total of seventy one games scoring twice in the process. His ability to spot a pass, put in a great free kick and avoid onrushing opponents with an imperceptible drop of the hips was a joy to watch. If he had just one fault it would have to be his lack of pace but at his age it was to be accepted. Jeff takes on the Galway post with the team struggling at the bottom of their division after the first six games of their season. With just twelve teams in the League he has another nineteen games to rescue their season, they play each other three times? ?, starting this Friday evening against Bray Wanderers. It goes without saying that all at Harriers Online and Kidderminster Harriers wish Jeff well in his chosen path.